Our client’s businesses encompass a broad range of financial services asset management, banking and consumer finance, credit and charge cards, insurance, investments, investment banking and trading and use diverse channels to make them available to consumer and corporate customers around the world. The group has a huge global presence including Asia Pacific, Middle East, Europe, America, Latin America, Mexico and Japan. Our client is largely organized into five business groups. SNACC is used for communicating trade information with the various 3 party agencies, such as, GSCC (Government Securities Clearing Corporation), NSCC (National Securities Clearing Corporation), MBSCC (Mortgage Backed Securities Clearing System) and EMCC (Emerging Markets Clearing Corporation). SNACC Application is currently in production on Solaris 2.5.1. Sun Microsystems is to phase out support for Solaris 2.5.1 & hence, The client has decided to migrate SNACC to Solaris 2.8. The migrated SNACC application also needs to be compliant with CITM and Distributed Database policies. Many of the SNACC technology components were required to be upgraded as part of this initiative. e.g. - Sybase from 11.0.3 to 12.5, RW library to FORTE. 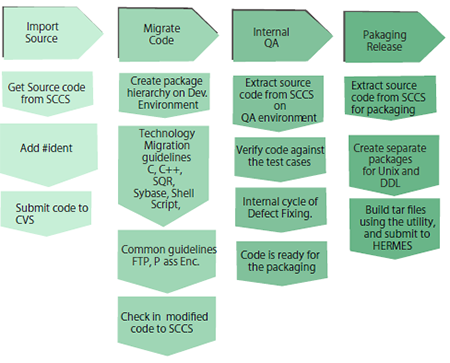 Standardize source code control system to SCCS. Add scripts for Package installation for multiple environments like Development, UAT & Production. Add standard headers to all source files. Centralize the environment variables used in the code. Create standard format environment file. Centralize FTP Server Names and User names. All Passwords should be encrypted. The Sybase binaries should be a part of the package itself. SNACC Application is required to be made ANSI compliant, UDEEG compliant & Security compliant. It required adherence to standard directory structure, XENV usage, HERMES for deployment, Password Encryptions etc. SNACC is a conglomeration of technologies on Unix platform like C/C++, Sybase, integrated with in house libraries like TGL, TGMMDB, AutoSys, and Shell Scripts applications. The first challenge was formation of good project team with relevant skills in these technologies. Large offshore team was planned to work remotely on VPN. Infrastructure challenge to support such large team & provide good performance during development was key factor. Xoriant in Mumbai setup a team with a combined strength of individual technological expertise as well as considerable experience of working on Unix development and deployment environment. Xoriant was responsible for entire migration & unit testing of SNACC application. The client was responsible to provide all relevant inputs for migration / unit testing. The client was also responsible for production promotions. It also fully utilized its existing stable and secure infrastructure to establish VPN connectivity to The client servers, as all the project development & testing was done directly on The client network. This included following checklist for migration as well as testing. Every package submitted to Hermes was checked against these checklists to ensure quality standard compliance. Knowledge sharing sessions were conducted to ensure smooth execution of migration tasks, avoiding personnel dependencies on most of the tasks. Dedicated resource was assigned for tasks of configuration management , Packaging , Release Management and Defect Analysis and Reporting . Peer reviews , test case analysis , and scope definition , was done on regular basis to accommodate updates in the project task-lists. Xoriant team with its technical & process competence worked out many value-adds during the project execution cycle.